Common Name: Cynanchum paniculatum, Paniculate swallowwort root. Part Used & Method for Pharmaceutical Preparations: The roots, or rhizomes, are dug and gathered in autumn, cleaned, dried in the shade and cut into slices. 1. Wind-damp obstruction syndrome manifested as rheumatic joint pain, lower back pain, abdominal pain, toothache and pain due to external injuries. 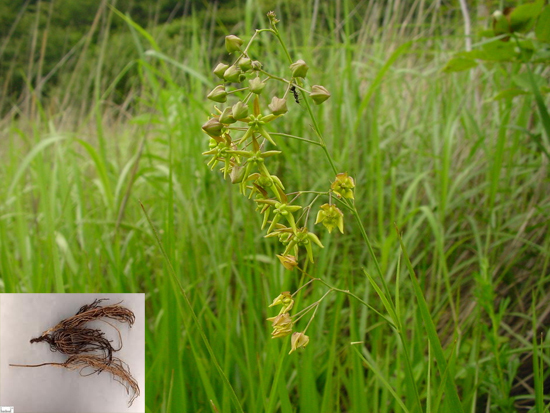 Paniculate swallowwort root (Xuchangqing) is used alone, or with other herbs in accordance with clinical manifestations. Radix Sophorae Flavescentis (Ku Shen), Fructus Kochiae Scopariae (Di Fu Zi), and Cortex Dictamni (Bai Xian Pi). Dosage: 3-10 g decocted in water for a short period only; 1.5–3 g, if used as powder. Cautions & Contraindications: This herb should not be boiled too long.